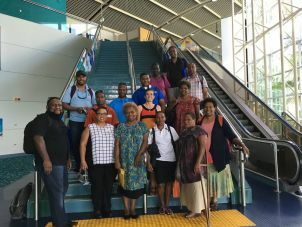 Academic, research and teaching ties between James Cook University in Australia and the University of Papua New Guinea are continuing to grow from strength to strength. The Project is currently being implemented to provide a series of learning, teaching and research activities focused on building the research capacity within the two universities. 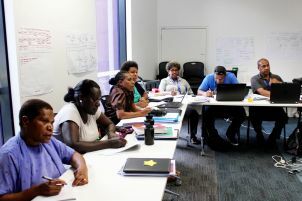 JCU’s internationally recognised and Australian accredited 'Graduate Certificate of Education (Academic Practice) (GCE)' provided to 3 cohorts of participants from UPNG with the final cohort being delivered by UPNG. 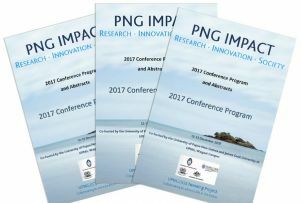 PNG IMPACT, a research-focused conference. The UPNG/JCU Twinning Project is being delivered over three years from mid 2015 until mid 2018. A Joint Steering Committee is in place and meetings are delivered quarterly. Project success will underwrite long-term collaboration between UPNG and JCU. Strengthen UPNG's teaching, learning and research capabilities. Further the Memorandum of Understanding established between UPNG and JCU. Provide a platform that contributes to delivery of the State of the Tropics agenda. Build UPNG and JCU’s capacity as a preferred supplier of skills and knowledge to strengthen our universities capability and capacity throughout the tropics. The Project Manager, Dr Jennifer Gabriel at The Cairns Institute on +61 7 4232 1875 or email jennifer.gabriel@jcu.edu.au. On Tuesday 13 March 2018, twenty-two staff of the University of Papua New Guinea were awarded the Graduate Certificate of Education (Academic Practice) at the James Cook University Graduation Ceremony in Cairns. 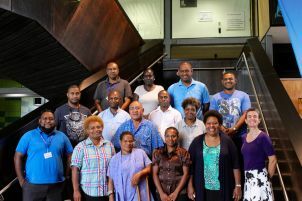 The completion of the Graduate Certificate of Education (Academic Practice) by a select group of UPNG staff is an outcome of the Teaching Quality component of the UPNG/James Cook University (JCU) Twinning Project, funded by the Australian Government. Develop a coherent approach to the evaluation of learning and teaching in higher education. The graduation ceremony was held at the Cairns Convention Centre. The Occasional Address was delivered by Dame Carol Kidu DBE, who was awarded an Honorary Doctor of Letters (HonDLitt). Research and education across all disciplines are essential to realizing global and national commitments to sustainable development. Knowledge, design and innovation are as important to governance, peace, safety, health and environmental integrity as they are to economic growth and poverty alleviation. As ICT, energy and bio-technologies transform the ways in which people interact, move and work, worldwide, new opportunities are emerging, both to utilize and to protect, PNG's unique human and natural endowments. Capitalizing on these opportunities will require more though than simply doing research. At PNG IMPACT, speakers and delegates considered how research can be designed, coordinated and communicated to deliver societal benefit. Recognizing that no one approach is relevant across all disciplines and issues, case studies were presented from a diversity of perspectives, with ample time dedicated to dialogue and networking. Showcased a cross-selection of active research projects, across the sciences, social sciences and humanities, delivering societal benefit for PNG. Promoted dialogue over how research and research policy can best support aspirations for a safe, inclusive and sustainable society. Provided a platform for network-building among researchers, research institutions and research stakeholders active in PNG. Keynote presentations showcasing best-practice examples of research providing significant societal impact in PNG. Panel discussions addressing governance, policy and institutional frameworks for high impact research and innovation. Day 2. 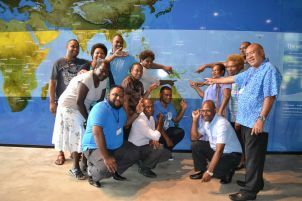 Research Innovation Lab - provided an interactive and participatory opportunity for researchers active or interested in PNG to share work, network with colleagues, and explore new collaborations. The program for the day will include a mix of research presentations, facilitated dialogue and open networking. Day 1 of PNG IMPACT, the Research Showcase, was open to anyone with an interest in the role of research in societal transformation. This included, but was not limited to: policy-makers, donors, philanthropic organisations, business, research leaders, researchers, students, civil society representatives and research students. 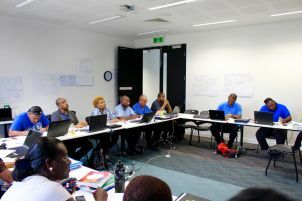 Day 2 of PNG IMPACT, the Research Innovation Lab, was open to anyone either active, or aspiring to be active, in the PNG research and innovation sector. Participants included researchers, research stakeholders and research students. These workshops are aimed at improving the academic writing skills of participants, fostering collaboration between researchers at UPNG and JCU, and accelerating the submission of high quality manuscripts reporting PNG-based research to international, peer-reviewed scholarly journals. Two workshops have been delivered through the Project and writing teams formed to publish journal articles. 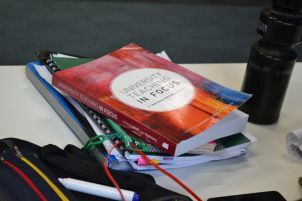 ECR workshops aim to assist new academics to become independent, productive and competitive researchers. 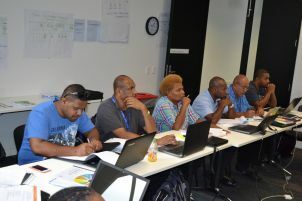 Staff members from UPNG have attended the five day ECR workshop to enhance their research skills. For more information, please refer to the video below. 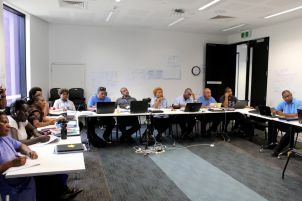 The GCE aims to support the development of UPNG staff and subsequent design and delivery, JCU staff members work with UPNG staff to deliver the internationally recognised and Australian accredited post-graduate course. The GCE is delivered to three cohorts of UPNG participants, with the transition of the course to be delivered by UPNG as a major outcome. The GCE provides a formal credential, focused on contemporary pedagogies and curriculum design, including skills in the use of accessible learning technologies. It is a four-subject course to support academics to understand, develop and deliver quality academic programs in their discipline area.